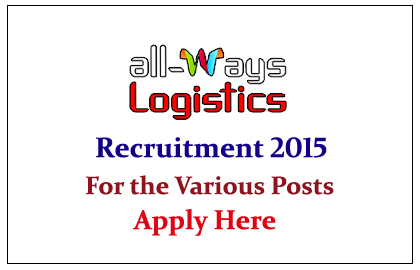 All-Ways Logistics India Pvt Ltd is recruiting for the post of Manager / Assistant Manager, Senior Executive / Executive 2015. Interested and Eligible candidate can apply here. All-Ways Logistics India Pvt Ltd is an INR 2500 million company, which provides comprehensive multimodal logistics solutions spanning International Freight by AIR & SEA for inbound or outbound shipments with last mile connectivity helped by a large scale network and multi-locations. We are in the process of expansion and looking for young, passionate, self-driven and result oriented professionals for multiple locations (AHMEDABAD & MUMBAI) preferably from Freight Forwarding Companies /NVOCC/ Lines with the immediate appointment. * Graduates/ Post Graduate With Minimum 5-7 Years Valuable Experience In A Large/Medium Sized Freight Forwarder/Fcl Consolidator/ Nvocc/Cha's/ Lines In Similar Capacity. * Proven Track Record In Generating And Achieving Targets Set. 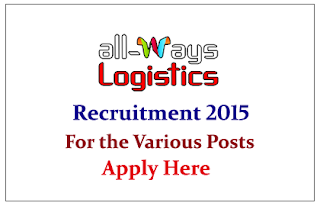 * Young & Dynamic, Result Oriented & Has Good Leadership, Interpersonal & Communication Skills. * Capable Of Identifying New Business Opportunities. * Should Not Only Be Able To Lead, But Also Guide And Motivate The Sales Team In Achieving Company's Common Targets. * Graduates With Minimum 3-4 Years Valuable Experience In Direct Sales & Marketing In A Large /Medium Sized Freight Forwarder / Fcl / Lcl Consolidator In Similar Capacity. * Proven Track Record In Achieving Targets Set. * Extensive Market Knowledge & Capable Of Identifying New Business Opportunities.